A loft kitchen is a great idea, most people find that their downstairs kitchen is never big enough or does not give them enough room to conduct their culinary masterpieces. Building a loft kitchen will allow you to start from scratch and design your own fitted kitchen. Like all things though, you often have to put a lot of hard work in before you are able to reap the rewards, and a loft kitchen can be a lot of work. You may have built up images of your new loft kitchen in your head, but a lot of your kitchen design will be dictated by how your drainage and plumbing is situated, as they will need to coincide with the appliances in your kitchen. There is no point putting your cooker somewhere where it will not be able to connect to a gas supply, or similarly your dishwasher next to somewhere with no water supply. 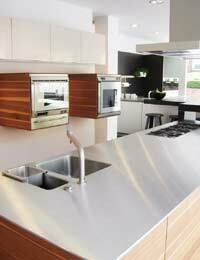 You will need to work closely with your structural engineer on your kitchen design. Your cooker, sink, washing machine and fridge/freezer will all have to link up to electric and water supplies. You may find that you will not get the same water pressure in your loft as you would with your kitchen fitted elsewhere in your house. You will need to consult building regulations for any kitchen in a loft conversion. The building inspector will be worried about the weight that your loft kitchen appliances are putting on your floorboards. You will need to reinforce your floorboards and make sure that your floorboard is either cemented or adequately tiled to hold up the weight of your appliances in your loft conversion. You may even have to fit an RSJ or extra support to the rooms underneath your loft, which may disturb your other rooms for some time. The potential fire hazards will also be a concern of any building inspector, you will need to follow fire regulations and make sure you can show you have adequate ventilation in your loft kitchen and have good access in and out of your loft. Ventilation is particularly important in a loft kitchen, you will need to have ventilation for your cooker and follow fire regulations, which will mean an outside ventilation flap on the outside of your loft. A loft kitchen will also need a window fitted, to allow in extra light and ventilation, the last thing you want is your new loft kitchen smelling of your most recent curry. A loft kitchen may not be the first idea that springs to mind when you think about converting your loft, but if you are willing to suffer the disruption then you can benefit from a secluded and private kitchen. A loft kitchen is great for dinner parties and will give you lot more extra space in the rest of your house. Your loft can also provide great views for you to look at when creating your favourite dishes. Loft kitchens are not the most practical of ideas when it comes to what to do with your loft space, but that doesn’t mean they are not worthwhile. There is little point creating a loft kitchen in a small loft. Loft kitchens are designed for large open spaces that will be able to create enough ventilation for all your fine dining. A loft kitchen will take a lot longer to design and convert than your average loft bedroom, but if you are up for the challenge, then the end result could be a lovely new fitted kitchen.